Step back in time to a more leisurely age and holiday in a historic Rangitoto bach. For the first time in over 100 years you can now book a bach stay on Auckland’s iconic volcanic island. Since the 1920s the baches on Rangitoto have been available to only a few lucky families but now you can join them. Two of these little cottages have been lovingly restored in keeping with their age but with the addition of modern bedding, cooking, heating and toilet facilities. Supplied in the kitchen to use are utensils, pots, pans and a chilly bin with ice packs to keep your food cool. Bach 78 is located opposite the the Islington Bay Wharf on Rangitoto Island. It has 2 bedrooms and has gas cooking, solar powered lights and a chemical toilet. 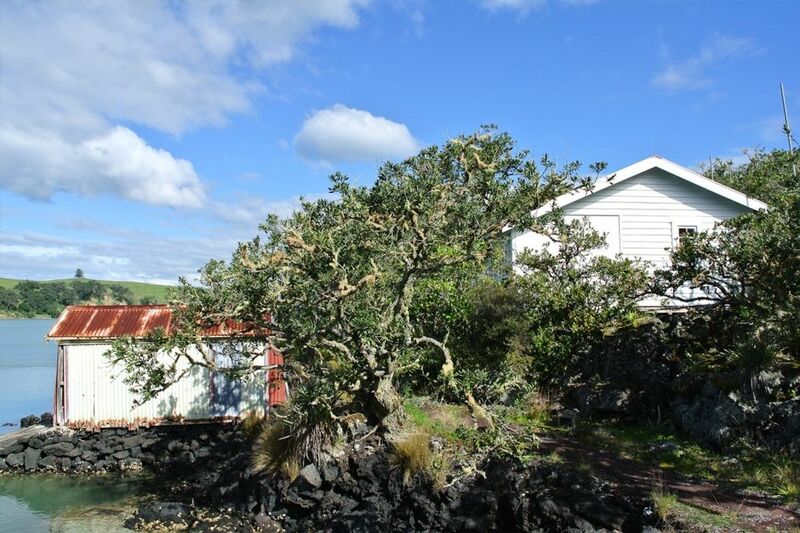 There is a network of well-defined walking tracks giving access to the volcanic features of Rangitoto and the native bush restoration and archaeological sites on Motutapu. The views from the summit of Rangitoto is a must do feature of time spent on the island. Both islands are pest free and you will see native birds and other native wildlife often absent on the mainland. While the rocky shoreline of Rangitoto can make swimming difficult the sandy beaches of Motutapu are just a short walk away. Access is by Fullers Ferry, Auckland Sea Shuttle (0508 SEA SHUTTLE), or private boat. Bach 78 is located at Islington Bay near the Islington Bay wharf, on the eastern side of Rangitoto Island. The bach is an hour and a half walk from Rangitoto Wharf or a two and a half hour kayak from Auckland. - Travel arrangements must be made separately. The Department of Conversations biosecurity rules apply. Small animals, ants, rainbow skinks and weeds or exotic seeds are the biggest threats to the pest-free status of our special islands. Gear that has been in the garage or even stored in the house could be hiding rodents, skinks, insects and seeds. So we need your help. Complete the DOC Biosecurity checklist for visiting pest free islands and hand it to the bach manager or Island Ranger when you arrive at the island. Our family spent 3 nights on Bach 78 and had a truly fabulous time. We felt at times we were in a 30’s movie set, the bach was decorated lovingly and the location by the waters edge was beautiful. Thank you Susan for looking after us and we look very much forward to coming back. Amazing place to stay - beautifully preserved taste of times past in a stunning location. Stunning seaside location on this fabulous natural volcanic island, away from all the pressures of modern life yet so close to a rapidly expanding city. a real privilege to have been able to stay in such a fabulous place. Please don't change anything! Thank you. Lovely to visit again !! We love bach 78. Our last visit was during colder months and it was a treat to experience the bach and make the most of its watery surrounds. We swam a lot and made great use of the kayaks in the boat shed and adventured around the bay and across to Motutapu. This is the perfect spot to relax, get away from the busy of our everyday lives and remember that simple can be amazing. The walk over was a bit quicker for us this time but it was still a solid 90 minutes with the 11 year old setting the slower pace. Special mention to Neil from the Motutapu Trust for being such an amazing tour guide, on his own time - the kiwi release that we lucked in on was incredible - the tour of the Gun Emplacement and walk through the Motutapu bush were both highlights. And just when we thought it didn't get any better, we stumbled across a pair of Takahe - talk about spoilt for highlights! Because the high tides were in the late afternoon when we visited, we ended each day with a wharf jump and paddled across to the boat shed ramp. p.s. Boat shoes would be a good idea to bring along as the ramps can be sharp and slippery but you can do without shoes if you are very cautious with your footing. Small but perfectly formed bach in an idyllic location. Took the hard way to get there via the coastal walk plus under-estimating how heavy our packs were, so definitely in need of a drink and a lie down when we finally arrived later than we expected. Marian popped by to see that we had settled in and explained any quirks, although it was all fairly straight forward. Had a wonderful time not really seeing any people for a couple of days and enjoying the opportunity to further explore Rangitoto and Motutapu Islands.